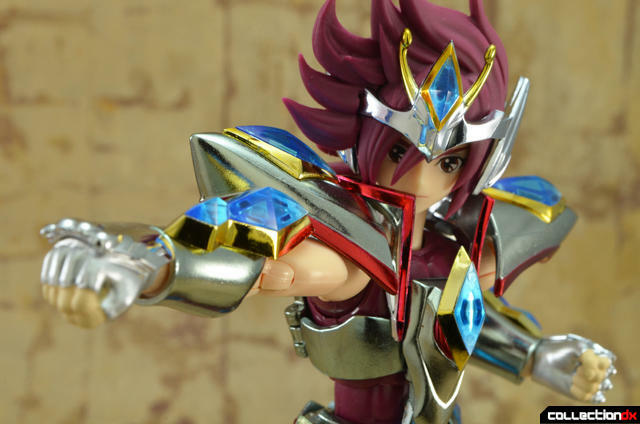 Pegasus Kouga burns his cosmos on CollectionDX thanks to Bluefin Distribution. Pick yours up at The Toy Source! 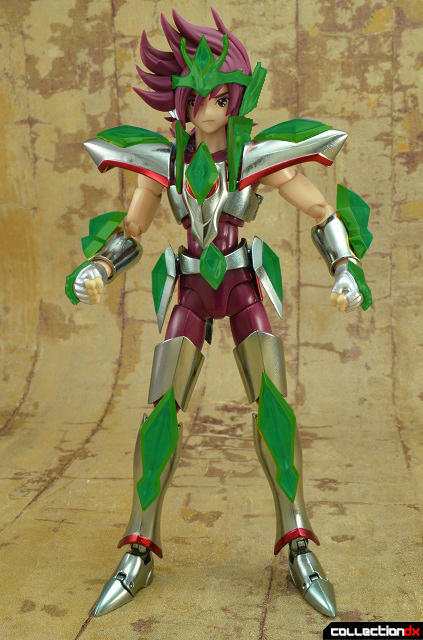 In Saint Seiya Omega, Pegasus Kouga is the leader of the new generation of Saints. Much like the Pegasus Saints that came before him, Kouga is a headstrong young man with an immense loyalty to his friends and Athena. 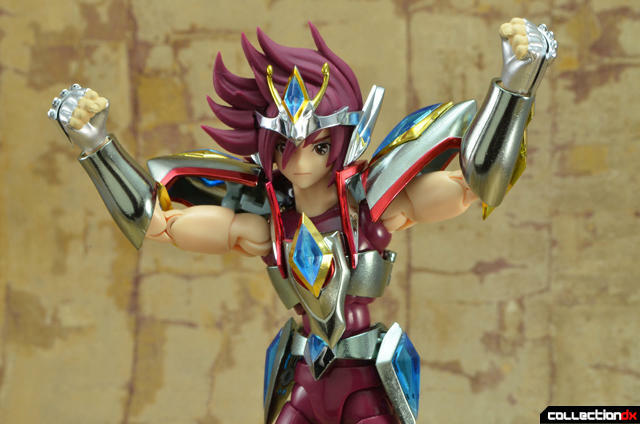 Now that Saint Seiya Omega has been on the air for several years, Bandai has decided to introduce several of the characters from the show into the Saint Cloth Myth line. 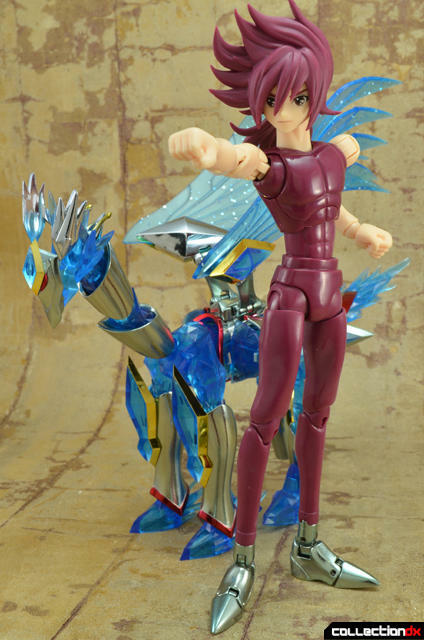 The first Omega character in the line is the aforementioned Pegasus Kouga. 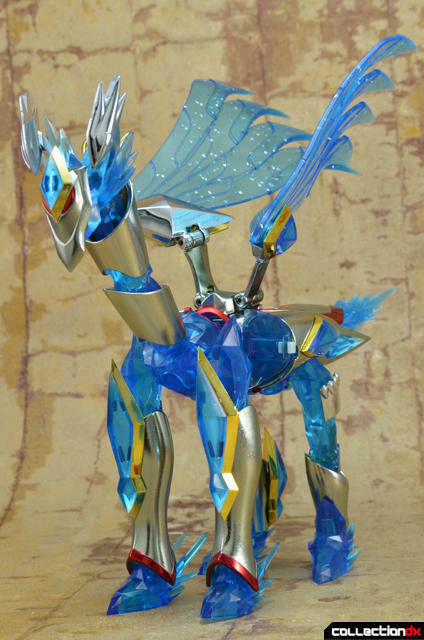 The Object Mode for Kouga’s Cloth is a Pegasus. It is fairly easy to assemble and it holds together well enough. The only issues I had with the Object Mode were with the feet, which sometimes would fall off. The toy representation of Object Mode is pretty decent. 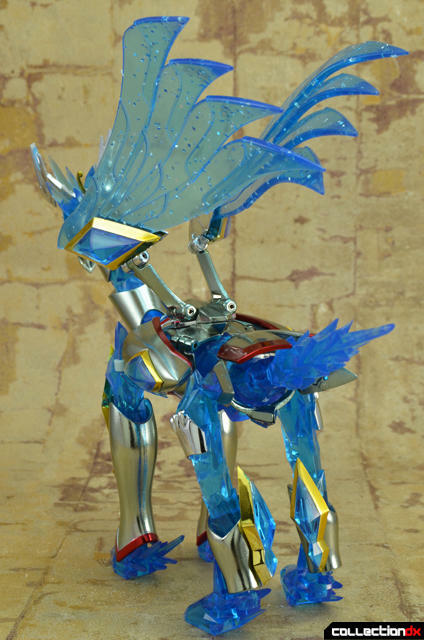 However, Bandai took some liberties with the amount of translucent blue parts that they used for the toy. The entirety of the face, neck and most of the wings on the Object Mode be metallic. Instead, the toy has quite a bit of blue plastic in these parts. So this makes the Object mode look like a plastic toy rather than a glorious combination of metal armor. 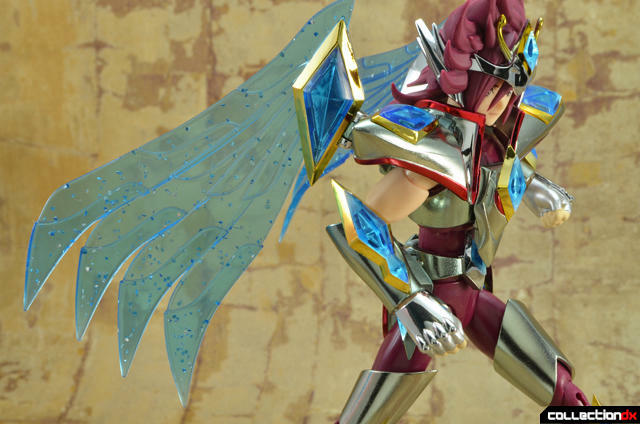 In the first story arc of Saint Seiya Omega, the Saints wear form-fitting Cloths that appear to be a combination of armor and fabric. In the second story arc of the show, the armors revert back to being more in line with the Cloths of previous Saint Seiya shows. This is Kouga's Cloth from the second story arc. In the first story arc, the Saints kept their Cloths inside of jewels. The jewel’s shape is also incorporated into the design of the Saint’s Cloth. As you can see, this feature makes its transition into the second Cloth of Pegasus Kouga, which is true for the other Saints as well. The design for this Cloth is known as the Pegasus New Cloth. Due to the presence of the jewels, which are made of plastic, this toy has its fare share of plastic pieces as illustarated in the picture below. However, there is still a good amount of diecast in this figure, so it has a nice heft to it. The fit and finish of the toy and the armor is pretty good. I did, however, have a few issues with it: the thigh armor slides down sometimes and the crystal in the belt will also pop off. But the pros for this figure far outweigh the cons. I liked the translucent blue pieces of the armor more than I thought I would. They definitely help differentiate this release from the other Saint Cloth Myth releases. The SCM Myth Kouga is obviously a bit taller than its S.H. Figuarts counterpart. No surprise there. 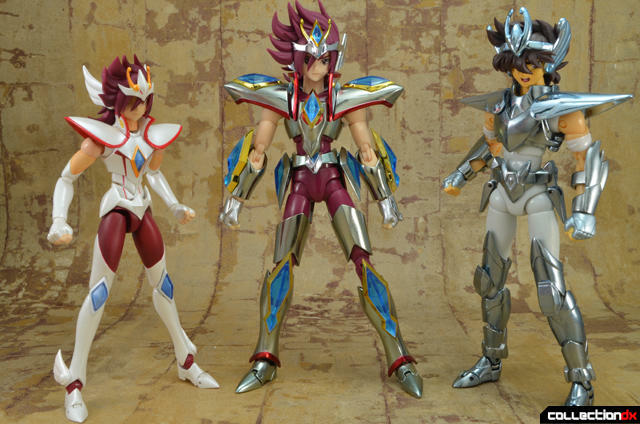 What I was not expecting, however, is that the SCM Kouga is also about half a head taller than the SCM Seiya. Kouga is actually as tall as some of the Gold Saints, such as Virgo. Since the Gold Saints are adults and the Bronze Saint are teenagers, I wonder what is up with Kouga’s height. 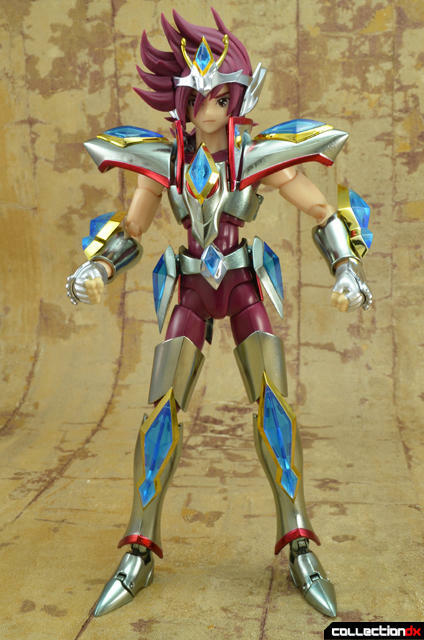 It could be that the Saint Seiya Omega SCM figures have their own scale that is separate from the original. Articulation is what you would expect from a third generation Saint Cloth Myth body. 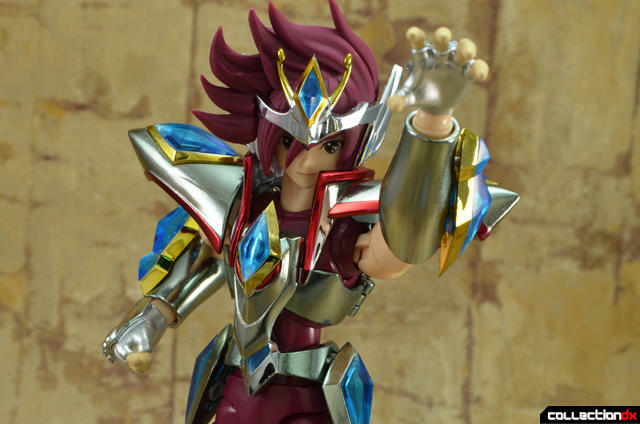 With the armor on, Pegasus Kouga still has a good range of movement. 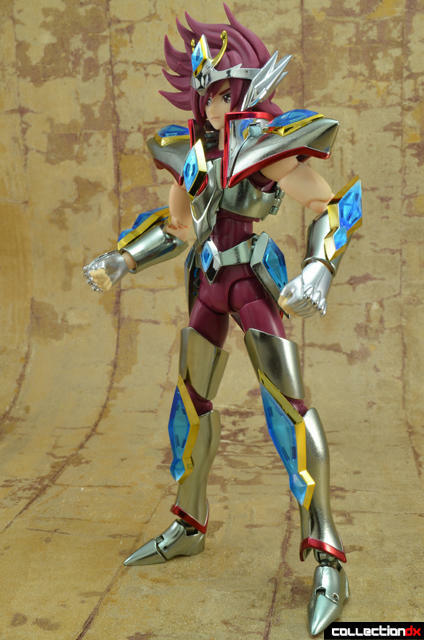 Even though the Cloth has a lot of pointy parts, the Saint Cloth Myth body and the armor’s engineering work together to deliver a figure that moves pretty well. He can take a knee with little trouble thanks to the awesome articulation on the legs and the hinged side skirts. However, the legs and feet are a bit wonky when you separate them for a wide stance. The legs have a tendency of separating more than you want them to and the surfaces of the feet are a bit awkward when they make contact with the surface the toy is standing on. Also, the ankle hinges are somewhat restricted by the flares at the bottom of the leg armor. With Saint Cloth Myth, these are crucial joints for getting a nice wide stance that looks natural. Lets move onto the upper body. Bandai put in clips on the shoulder pads to allow the arms to extend upwards. 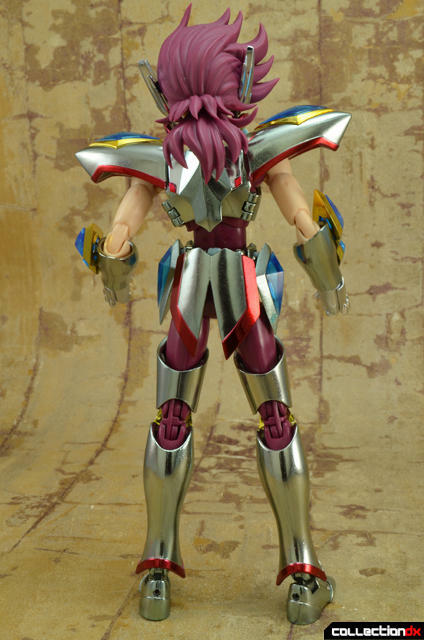 However, the bulky shoulder pads do not lend themselves to being raised much. This impedes upper arm movement quite a bit. Trying to get Kouga to ready a Pegasus Ryuseiken proved to be harder than I thought. But he can fire off a good Ryuseiken pose. Extras for this release are a bit scarce. You get four pairs of hands, including the unarmored hands that are not pictured. Interestingly enough the hands for this release are attached to a holder. As far as I know this is a first for the Saint Cloth Myth Line. This holder piece reminds me of the ones that are included with Figmas, so it is a bit odd seeing a piece like this in a Saint Cloth Myth release. 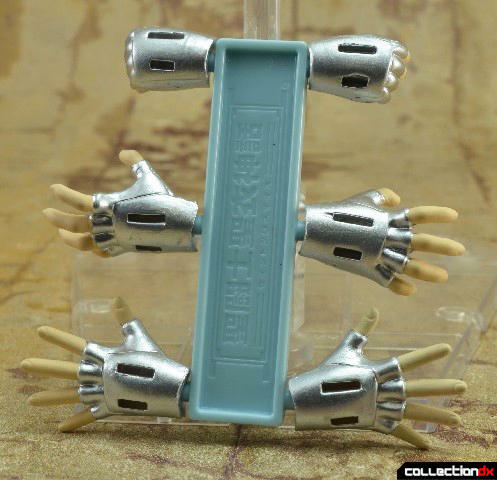 The holder piece is quite handy (no pun intended), so it would be cool to see it included in future releases. No fumbling around the plastic tray to pick up these hands! You just take the holder out of the tray and grab the hands you want. 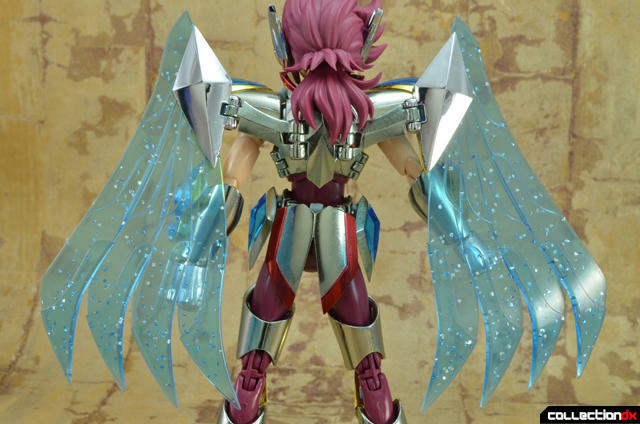 As another extra, you can attach the wings of the Pegasus Cloth to the back of the toy. 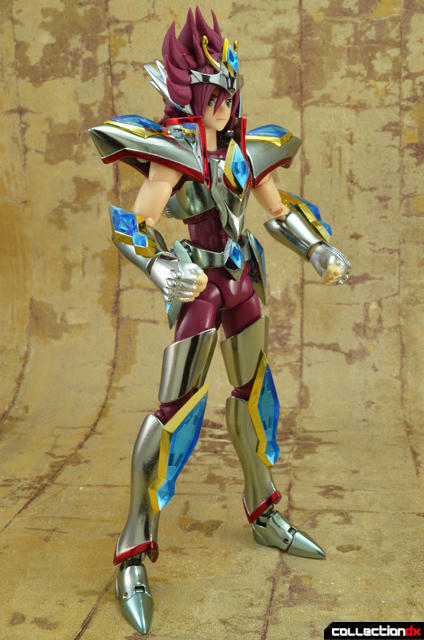 I am not up to date with Saint Seiya Omega. However, I assume that much like Seiya, Kouga’s Cloth can also sprout wings whenever the occasion calls for the Saint to fly. The addition of the wings to the toy it look much cooler and fitting of the leader of the new Bronze Saints. Like with the Object Mode, the majority of the wings should have a metallic finish. Since these are the same wings that are used on the Object Mode, they too are not as accurate as they could be. But this time around, I really liked the translucent blue wings with sparkly bits inside. 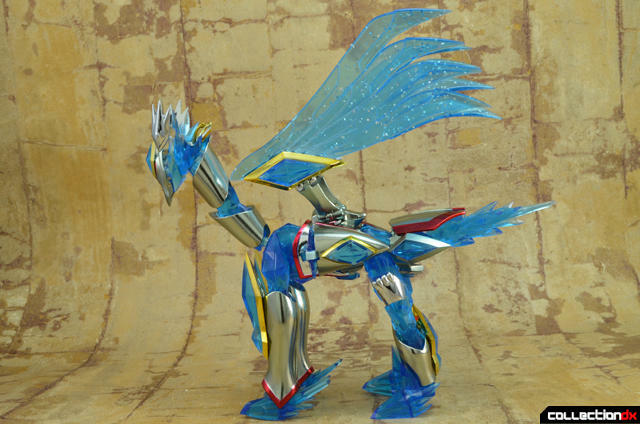 There is enough metallic paint of the rest of Kouga’s armor to keep the addition of the translucent wings from making the toy look like it is dominated by these blue pieces. The wings have a couple points of articulation. You can elevate the blue piece of the wings about 35 degrees. As for the metal part of the wings, each one has two hinges so that you can maneuver forward and back in pretty much any manner you like. That is it for the extra though. I would have really liked to see at least one extra faceplate for this release. The S.H. 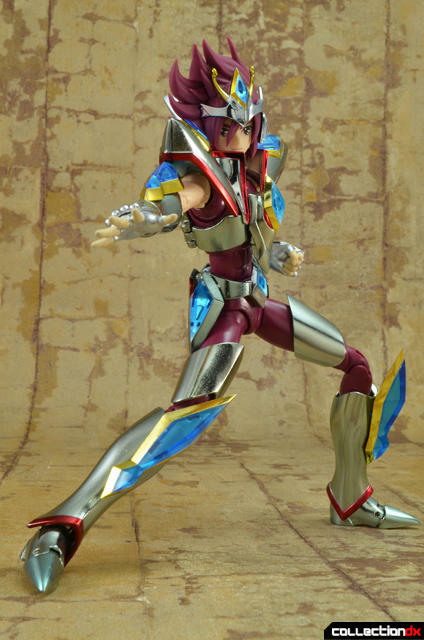 Figuarts Kouga had 3 faceplates, so it was more expressive than this version of Kouga. 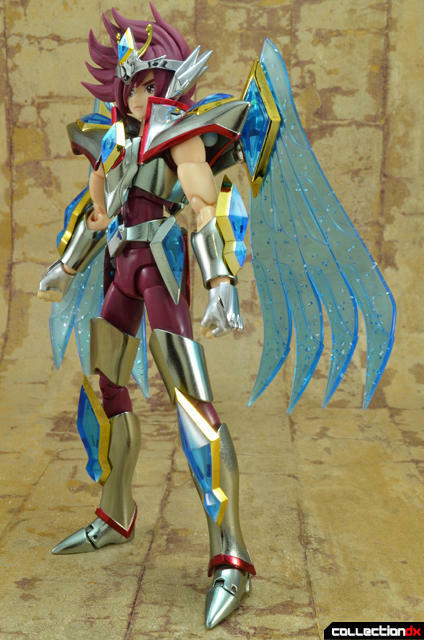 All in all, the Saint Cloth Myth Pegasus Kouga is a pretty good release. 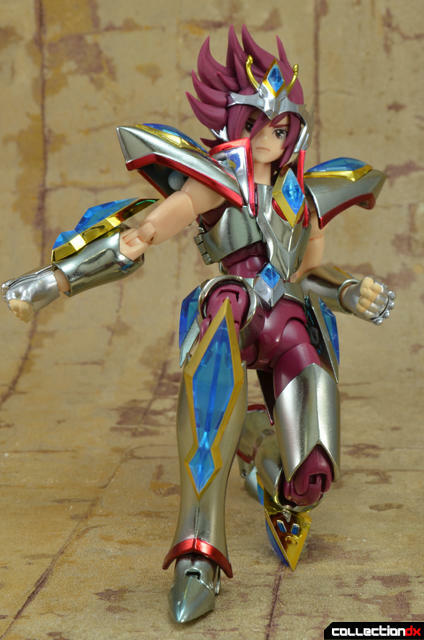 All of the engineering and quality of the main Saint Cloth Myth line is present in this toy. 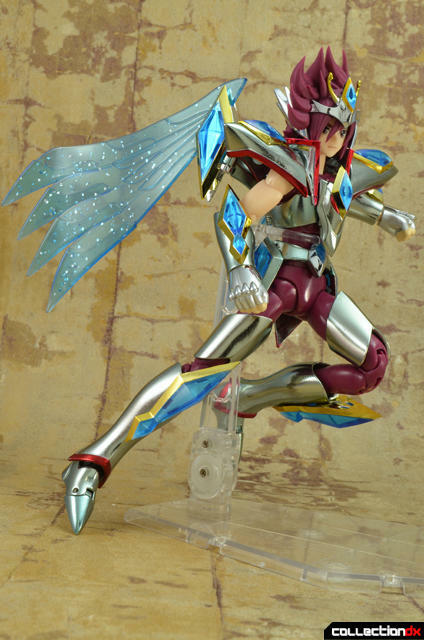 It is a must have for fans of Saint Seiya Omega series. As for me, I am more of a fan of the original series. 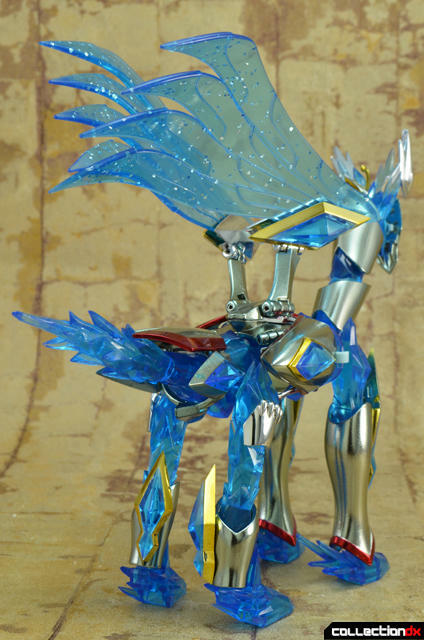 However, this will make a nice addition to my Pegasus collection of Saint Cloth Myth figures. Haha. I thought the same thing at first. However, the SCM Kouga is taller overall. It is easier to see when the height difference when the toys are a bit close than in the picture I took. The first thing I thought when I saw this review (not really having any experience with Saint Seiya) was "Kuuga isn't spelled that way!" Nice review. 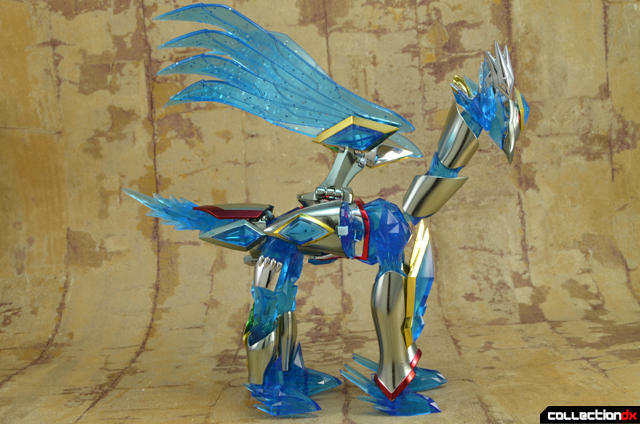 Seeing as how Kuuga has a Pegasus form, I can totally see how you could have thought that you saw what you saw. 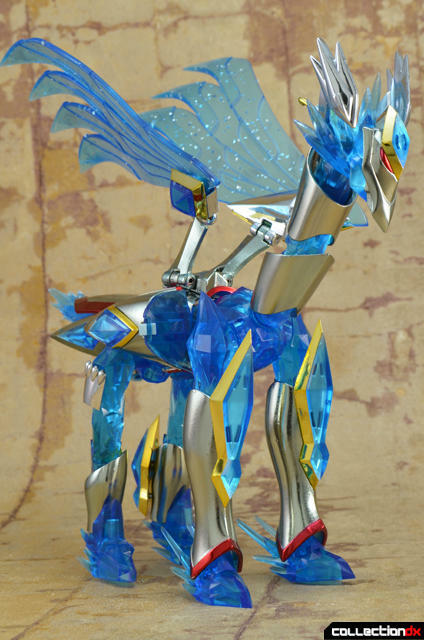 I figured I would check out the Omega Pegasus Kouga. I have a pretty nice collection of the Pegasus Saints going. At first, I was not a fan of the designs from the CG movie, but some of the new Cloths are really starting to grow on me. If nothing else, I will check out the new Seiya.